It was a special honour having two famous Brazilian actors visit our schools in Vancouver and Toronto to practice their English. GEOS had the privilege of welcoming Fernanda Moro and Edson Cardoso. 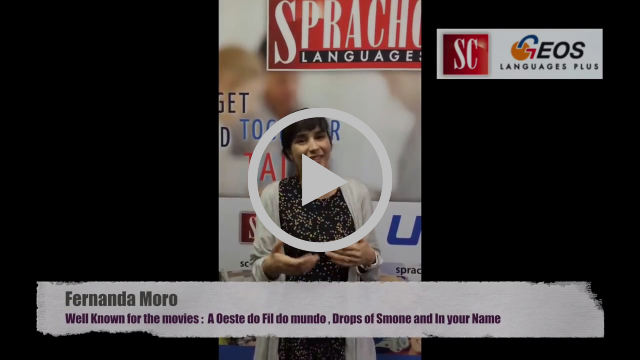 Fernanda Moro studied English in our Toronto school and made this video of her experience with GEOS. Edson Cardoso visits our GEOS school in Vancouver and speaks about his time there. When learning a language, students either want to work mostly on listening and speaking skills, or have the most challenges learning them. Therefore our English school in New York decided to focus more on those skills during an out of classroom activity. Teachers collaborated with students to choose a TV show, which they watched at home and discussed in class afterwards. Students from SC GEOS School in Vancouver took advantage of the fun activities at the PlayDome at BC Place stadium. It’s Canada’s largest and most anticipated indoor carnival and ran from March 22nd- 26th. The carnival had over 45 rides and attractions to choose from all under one roof and is unlike any other. Talk about impressive! On March 8th, The SC GEOS school in Toronto expressed their gratitude for all our incredible ladies in honour of Women’s Day with beautiful yellow, white roses and chocolates. International Women’s Day (IWD) is a global day celebrating the social, economic, cultural and political achievements women have done, and continue to fight for around the world. The SC GEOS school in Boston were in the festive Irish spirit in celebration of St. Patrick’s Day on March 17h. Students and staff proudly wore green and embraced the luck of the Irish by making even themed personalized homemade cards. They watched videos about the history behind the celebration as well. The day was not only fun but educational too! Our SC GEOS school in Ottawa had a ball playing pool, enjoying each other’s company and some needed relaxation time at MacLaren's on Elgin .Social excursions to local authentic establishments, are central to interacting with a language and being a part of a new community!